Installing protective equipment on power lines along highways or byways is difficult enough, requiring experienced electrical linemen and bucket trucks. However, mounting heavy, high tech gear on high voltage towers that cross a wide body of water is even more complex. 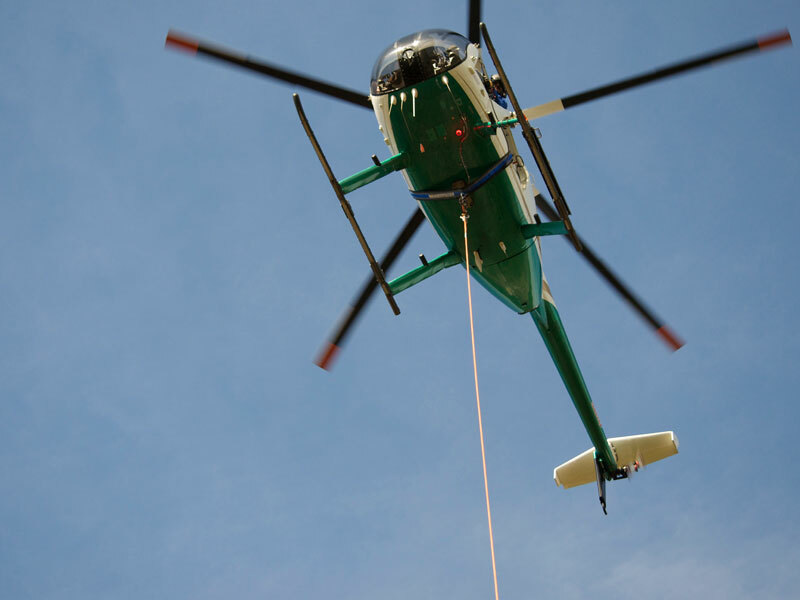 That’s why when Dominion Virginia Power needed lightning arresters installed on the powerlines that cross the James River, in Newport News, VA, they called in experienced linemen from Air2, LLC to get the job done. Lightning arresters are akin to surge protectors, and are used on electrical power lines to safeguard against the damaging effects of strong, sudden currents – like lightning strikes – when they go above a safe threshold. Arresters help keep the protective insulation from burning up or conductors from exploding, and instead divert excess currents to the ground. Unlike the handy surge protectors we plug in around the house, high voltage power line surge protectors are large, heavy and unwieldy. Electric utility companies usually use bucket trucks to install these devices when on land, but in this case, helicopters were needed. Lightning arrester installation by helicopter is faster and more economical since the helicopter can efficiently ferry the linemen, the lightning arrester devices, and tools to the lines (see picture #1). Bucket trucks often require permission from landowners, and cannot access lines over water or other areas that are difficult to reach.